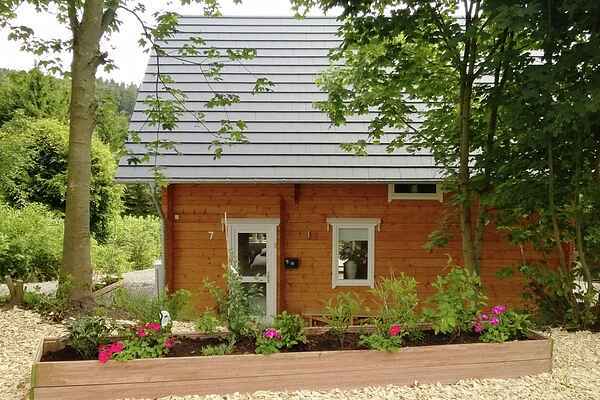 This cosy and charming wooden chalet is situated in the nice holiday village of Küstelberg. Küstelberg is located between Winterberg (just 8 km), Medebach (9 km) and Willingen (21 km). It is very centrally located in Sauerland, close to many nice villages, activities and sights. Küstelberg has three restaurants, its own ski slope with a ski school, and the bakery is less than 100 metres from the chalet. This is a lovely area full of natural beauty, and the very renowned and popular Rothaarsteig and Höhenflug, as well as other hiking trails, run past Küstelberg. This beautiful chalet is made entirely of wood, with a delightful ambience that will give you a wonderful holiday feel. It is fully detached, faces south and offers a vast view of the forest and mountains. There is a large garden, measuring no less than 1000 m2, with a terrace and dining area, multiple places to sit, and a trampoline and playground for the kids. The chalet is equipped with all the conveniences. It has a large Finnish sauna, a kitchen with a dishwasher and a large refrigerator, a living room with a television, a bathroom with a separate shower and tub, and a second toilet downstairs. There is also a large horseshoe-shaped seating nook by the kitchen with a view of the forest and mountains, a great place to eat or simply sit and enjoy the view. It is a wonderful spot for a holiday, whether you are looking for activity or relaxation.